Ajahn Sucitto's prologue to Cittaviveka, Teachings from the Silent Mind. Text and free download of the full e-book. 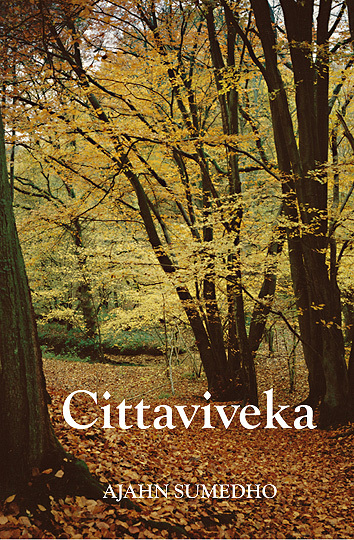 The following prologue from Cittaviveka, which was first published in 1983, chronicles the history of how the first Western branch monastery of Ajahn Chah took root in the UK. IN THE SUMMER OF 1976, Ajahn Sumedho requested permission from his teacher, Venerable Ajahn Chah of Wat Pah Pong Monastery in North-East Thailand, to visit his ageing parents in California. He had not seen them since leaving America in 1964, weary of the West and drawn by an interest in Chinese studies and Eastern religion to volunteer for service with the Peace Corps in Sabah, Borneo. World-weariness and an interest in Eastern religion have a way of breeding good bhikkhus, and it was not long before he became Sumedho bhikkhu  living under the guidance of a meditation teacher, Venerable Ajahn Chah, in a forest monastery in Ubon Province, Thailand. Time flowed by with its own teaching: one who endured the hardships and trials of the dhutanga monasteries  naturally acquired inner strength and patience, even without the sometimes aggravating, sometimes playful, and frequently awe-inspiring teaching methods of a master such as Ajahn Chah. The teaching was a whole training in ‘letting go’, in giving oneself up to the routines, the Vinaya (monastic discipline), the simple austerity of the food, clothing and shelter that were offered, and to the will of the teacher. Ajahn Chah, with compassion and notorious humour, would tease and frustrate his disciples out of their self-conceit, and those who really wanted to be delivered from their selfishness placed themselves, resignedly at first, but eventually with gratitude and devotion, under his guidance for a minimum period of five years. After seven Rains , Sumedho was allowed to go off on his own, and he wandered in India for five months, keeping to the strict Vinaya training of dhutanga bhikkhus – no money, no storing of food, and one meal per day, to be eaten out of the alms bowl before noon. Somehow in India, living on faith, it worked, and the respect for the tradition that this instilled in Venerable Sumedho encouraged him to return to Ajahn Chah and offer himself up, body and mind, to serve his teacher. Ajahn Chah’s response is not recorded – it was probably no more than a wry smile or a grunt – but in his eighth year, Venerable Sumedho was given the task of establishing a monastery for Western bhikkhus in a haunted forest a few kilometres from Wat Pah Pong, known as Bung Wai. After having made the necessary initial mistakes, he became the Ajahn of a monastery that has since developed into something of a showpiece in the forest tradition. Thai people – local villagers at first, and subsequently more cosmopolitan folk from Bangkok – were impressed by the presence of Western bhikkhus who had given up the wealth, university education and conveniences of Europe and America to live a sweat-soaked life that was austere, even by the rustic tastes of North-East Thailand. Accordingly, the monastery, Wat Pah Nanachat (‘International Forest Monastery’), became well supported and acquired a wealth of sponsorship that far exceeded the expectations of its Ajahn. More importantly, within a couple of years the modest foundation of four bhikkhus swelled to a sizeable group of bhikkhus, samaneras, por kaos and maechees . It was at this time, in his tenth year as a bhikkhu, that Ajahn Sumedho made a visit to America to see his parents, at his father's request. On the way back to Thailand, he stopped off in London and, as the Thai temple there was rather crowded, he decided to use a telephone number given to him by one Venerable Paññavaddho Bhikkhu. This put him in touch with George Sharp, Chairman of the English Sangha Trust and thereby custodian of the empty Hampstead Buddhist Vihara . Venerable Paññavaddho had been the Senior Incumbent of the Vihara between 1957 and 1962, having succeeded the founder of the Trust, Venerable Kapilavaddho. After an incumbency of five years, Venerable Paññavaddho had felt an interest in deepening his practice by living in the traditional forest environment of meditating bhikkhus, and had gone to Thailand to live under the guidance of Venerable Ajahn Maha Boowa. Ajahn Maha Boowa, like Ajahn Chah, stressed the importance of meditation, Vinaya and simplicity of life-style, and he also had a very fine forest monastery in North-East Thailand. The English Sangha Trust, the stewards and owners of the Vihara, had been established in 1956 with the express aim of providing a suitable residence for bhikkhus in England. By 1972, this aim had not been achieved, and it was time to consider why. In some people’s minds, in fact, it now seemed an impossibility. There were numerous views and opinions on this matter, but the chairman was drawn to consider the nature of the environment and the life-style of the bhikkhus. Several of the incumbents had been gifted Dhamma teachers, but none of them had experience of the traditional bhikkhu life, with its training conventions and mendicant relationship with the laity. So Mr. Sharp had begun corresponding with Venerable Paññavaddho, who had taken up that very life-style and obviously found it preferable to the ‘progressive’ atmosphere of Western Buddhism. In 1974, this correspondence had resulted in an invitation from the Trust to Venerable Ajahn Maha Boowa and Venerable Paññavaddho to visit Hampstead. Their presence was so inspiring that there was some hope that Venerable Paññaavaddho might remain in England, accompanied by other forest bhikkhus. After Ajahn Sumedho's visit in 1976, Mr. Sharp went out to North-East Thailand himself to visit the forest monasteries and make a further request to the two meditation teachers to send forest bhikkhus to England. Venerable Ajahn Maha Boowa, perhaps because he had visited the Hampstead Vihara – and seen all the difficulties that lay ahead in a country where people were ignorant of the bhikkhus’ discipline and the relationship between Sangha and laity – was rather doubtful of the idea. The Vihara, a town house opposite a pub on a main road in North London, didn't seem suited for forest monks. Ajahn Chah, however, decided to visit in 1977, and when he came he brought Ajahn Sumedho with him. Perhaps it was just another of Ajahn Chah’s tests to make his disciples ‘let go’, but as a result of the visit, he left Ajahn Sumedho at Hampstead with three other of his Western disciples, to stay until more suitable forest premises became available. The daily life was conducted in a manner that was based on the monastic routine of the forest monastery, with morning and evening chanting, a daily alms round [pindapata] and instruction to lay visitors to the Vihara. It was not an easy time for the bhikkhus – apart from culture shock and the sudden cramping of their environment, there was a lot of confusion as to the role of the Vihara, and how the tradition was to be altered, if at all, to fit English conditions. Perhaps in this country it was not appropriate to live in forests at all. In this atmosphere of doubt, it was only the bhikkhus’ training in endurance and obedience to the discipline and the structure of the Sangha that preserved a degree of harmony. In the spring of 1978, one of those small miracles happened that stop the mind's rational expectations. Keeping to the apparently pointless routine of going out for alms every day, as prescribed by Ajahn Chah, Ajahn Sumedho encountered a lone jogger on Hampstead Heath whose attention was arrested by the bhikkhus’ appearance. This jogger had acquired an overgrown forest in West Sussex called Hammer Wood, out of the wish to restore it to its former glory – but he also understood that this was work for more than one man and one lifetime. Although not a Buddhist, he had the openness of mind to appreciate that an order of forest monks might be the perfect wardens for his woodland. Subsequently, he attended one of the ten-day meditation retreats that Ajahn Sumedho held at the Oaken Holt Buddhist Centre near Oxford, and later made an outright gift of the forest to the Sangha. This marvellous act of generosity did of necessity involve a lot of legalities, as local bye-laws prevented the construction of any permanent structures on forest land, so in this situation the Sangha gratefully accepted the invitation to stay instead at Oaken Holt for the ‘Rains’ of 1978 and let the Trust sort things out. Early in 1979 Ajahn Chah was invited to England to see how his disciples were making out; it was also about this time that George Sharp, hearing that a large house near Hammer Wood was up for sale, agreed to purchase it. This was Chithurst House, and its purchase was a gamble that did not meet with unanimous approval. Buying the property had necessitated selling the Vihara and the adjacent town house whose rent had provided the basis for support for the Sangha – in order to purchase an unsurveyed and ramshackle mansion. In May, Ajahn Chah arrived, somewhat disturbed by rumours of his disciples’ activities, to find a monastic community that actually had nowhere to live. The new owners allowed the Sangha to use the Vihara for a couple of months to receive the Venerable Ajahn and to effect their move. In this atmosphere of insecurity, Ajahn Chah added one more doubt by intimating that he was going to take Ajahn Sumedho back to Thailand. While the Sangha members watched their minds, he went off to America for a visit and there was nothing else to do but go ahead. On 22nd June 1979, having bundled as much as we could into a removal van, we left London for Sussex. Chithurst House really was a mess. Small work parties sent down earlier had done some preliminary work on clearing the grounds, but they had been denied access to the main house. The owner had let the place run to seed: uncleared gutters had broken and spilled water over the walls so that dry rot had spread. As things had broken down they had been abandoned; when we moved in, only four of the twenty or so rooms were still in use. The electricity had blown, the roof leaked, the floors were rotten and there was only one cold-water tap for washing. The house was full of junk: all kinds of bric-a-brac from pre-war days. The outbuildings were crumbling, roofs stoved in by fallen trees. The cesspit had not been emptied for twenty-five years. The gardens were overgrown: a fine walled fruit garden was a chest high sea of nettles. Over thirty abandoned cars protruded through the brambles that smothered the vicinity of the old coach-house. But as we started to scrape through the mess, it felt all right. The situation left no alternatives: for better or worse, opinion was polarised and those who disagreed left. We had the support of the Arama Fund – a trust established by Venerable Paññavaddho to help found a monastery in the West – which purchased the lovely meadows around the house. So the omens were good. A stir of publicity initiated by the BBC programme The Buddha Comes to Sussex brought us a lot of attention – a mixed blessing, as this gave rise to the ‘invasion fears’ of a body of local opinion that proved awkward later. But at first it was enormous fun. The summer was fine, we had a steady influx of volunteer labour, and we all worked hard. We were loaned a marquee by a local Buddhist businessman, which served as a kitchen and dining hall. The weeds and debris in the grounds were attacked, temporary showers installed, drainage cleared and work begun on the kitchen. The community for Vassa (the ‘Rains’ retreat) consisted of six bhikkhus, two samaneras, eight male anagarikas, four women in training to become anagarikas and three or four lay people for various periods of time. It was a spiritual refuge that gradually took on a monastic form. In September, the women were given a separate place to live when a beautiful little cottage adjacent to Hammer Wood was rented for their use. About a year after their ordination as anagarikas in October, it was purchased with an estate that actually forms the ecological heart of the forest. Also in October our two samaneras were given upasampada  by Venerable Dr. Saddhatissa, using the River Thames as a sima boundary. So by the winter, we had a ‘monastery’ and a ‘nunnery’, and a sizeable group of bhikkhus going out for non-existent alms every morning. This spectacle must have been more alarming than we thought, and at first there was a lot of mistrust and reserve in the minds of local people, who tended to bracket any Eastern religion in the category of cults of idol worshippers following strange or – even worse – no gods. The discipline, with its emphasis on harmlessness and modesty, again helped us out where no amount of teaching of Buddhist Philosophy would have done. Our neighbouring farmer, for example, had been impressed that, although we were not going to kill the rabbits that live on our property and invaded his fields, we went to the trouble and expense of building a rabbit fence to keep them in. It was our effect on the environment and our neighbours that finally made the district council grant Chithurst House monastic status, with the freedom to train bhikkhus and nuns and live the monastic life in its conventional way. This permission came in March 1981; meanwhile, the monastery had established itself in other ways. In the summer of 1979 we constructed a kitchen – but we shivered through the winter wearing caps, scarves and woollen underwear until the wood-burning stove that was to heat the house arrived in March 1980. Work continued throughout that year, during which time one-half of the house was gutted from basement to top floor. Its rotten floors, doors and window frames were removed and burnt, so that we could create a new Shrine Room. The second winter saw a halt in the work programme, as available funds ran out. The monastery is totally dependent on donations, which tend to dry up in the winter. Ajahn Sumedho decided that this would be the perfect time for a monastic retreat, and this is the pattern that has established itself as a splendid yearly opportunity for a quiet period of intensive practice. At the end of the monastic retreat in February 1981, the Buddha finally came to Sussex in the form of a half-ton Buddha image sent by a generous lay supporter from Thailand. This was a cheering sign, and work began with renewed vigour. In the evening before Asalha Puja began the Rains of 1981, the new Shrine Room, dominated by this radiant image, was finished. For that Rains, at last, the community had a long break. Work had thus far been the major practice at Chithurst. Despite a couple of brief retreats, by and large the preoccupations were technical and material rather than scriptural or contemplative. Sometimes work would go on well into the night to complete a project. One time, the dam by the cottage showed signs of breaking up – so, whatever, it had to be fixed as quickly as possible. People would get exhausted and complain about not being able to meditate, but for the most part they understood that it was a trial period, a changing condition that, like any other, could afford insight into the Four Noble Truths once the situation was accepted. It was actually a very good time for practice: good Vinaya, good teaching, good support and a stable Sangha. One can even imagine that in the future people will be talking about ‘the good old days when the going was tough’. A sima boundary, defining a consecrated area for ordinations and official Sangha functions, was established by Venerable Anandamaitreya on June 3rd, 1981 in the monastery grounds where (at times, in a teepee!) we have held the fortnightly recitations of the discipline – the Patimokkha. Fittingly, a stone was set into the earth with the straightforward inscription Vinayo Sasanassa Ayu (‘Vinaya discipline is the life of the religion’). The other principal use of the sima – for ordinations – was made possible by Venerable Anandamaitreya on the afternoon of its consecration, when he conferred thera sammati – the authority of an upahjjaya  on Venerable Sumedho. On July 16th three anagarikas were ordained as bhikkhus there, bringing the total up to eleven. With this number it became possible to move people around, and the Ajahn was able to respond to a request for a branch monastery to be established at Harnham in Northumberland (opened 23 June). This monastery, originally an old farm-workers cottage, also grew in its next four years, until for the Vassa of 1987 there were five bhikkhus and two anagarikas in residence. Currently (1992, when this text was revised), they are hard at work converting an adjacent building into a larger Dhamma centre for the North of England and the Scottish Borders. This is one project among many for a Sangha that has diffused throughout Britain, as it and its support has grown. Local Buddhists set up a small monastery in Devon in 1983, which now acts as a centre for that region; and in 1984, the Amaravati Buddhist Centre was established in Hertfordshire as a national centre, on the initiative of the English Sangha Trust. An important consideration in the creation of Amaravati was the provision of more facilities for lay people. Until this time, the Sangha generally travelled away from the monastery on invitation to teach, and retreats almost always were held in hired premises. This meant that we were using accommodation that was not specifically designed with Dhamma practice in mind, and which therefore lacked the supportive qualities of a monastery; it also meant that retreatants had to cover the (frequently high) costs of facilities that were intended for rather different activities. For his part, Ajahn Sumedho had a few further ideas in mind – a place that had a meeting hall large enough to hold the many people wishing to come to public talks and special occasions; enough living space for large numbers of guests to stay with the community and participate in their life of practice; and suitable residences for the increasing number of men and women asking for the Going Forth into the Holy Life. Out of these wishes and a few minor miracles, Amaravati was born. Formally opened under the auspices of Venerable Anandamaitreya and Tan Chao Khun Paññananda in May 1985, Amaravati – ‘The Deathless Realm’ – occupies the grounds and the spacious wooden buildings of the former St. Margaret's School in Great Gaddesden. The centre has a monastic community of about forty men and women under the guidance of Ajahn Sumedho, and any number of guests on site living as part of the community, taking part in organised retreats in the separate retreat facility, or there for a public talk, festival or children's class. Once a year – in the same way that Chithurst has the bhikkhu ordinations – Amaravati is the setting for women to ask for the Going Forth as Ten-Precept Nuns (siladharas). So, with a mendicant lifestyle now available for women, the Holy Life is developing in conventional form as well as in numbers. And even as we are coming to terms with the possibilities that Amaravati has created, another branch monastery has opened and is flourishing in Stokes Valley, New Zealand (near Wellington); branch monasteries have been established in Kandersteg, Switzerland and Sezze Romano, Italy; and an invitation is being taken up to open a vihara in the United States, in California. Relating to all this is awesome at times, because the life of the Sangha is nourished by something far larger than the energies of individual monks and nuns. We realise that Buddhism is providing for a spiritual need in a large number of Western people, although its conventions are undemonstrative and our Sangha is quite young. With the sense of responsibility that this creates in the minds of the bhikkhus and siladharas there is a lot of effort going into supporting the faith of lay people, and into keeping the monastic training firm enough to make us fit for such responsibility. People living the household life have developed their practice in like fashion, and make full use of the monasteries. In fact, of the few ceremonial occasions that we have during the year, the largest is the Kathina, which can only be organised by lay people. Moreover, the Kathina is simply an occasion for offering requisites to the bhikkhus – and yet this ceremony draws an attendance that far exceeds our normal number of visitors. People seem to get a lot of joy out of giving to those who are ‘worthy of gifts’ . To find happiness in giving rather than gaining something is quite a turn-around in many people’s attitude towards life, a change of heart that is one of the blessings of a mature and sensitive relationship between Sangha and laity. What we have all realised, to our surprise, is the extent to which people are willing to live and support the Holy Life. The difficulty hitherto has been finding places where people could live as monks and nuns, and it wasn't until that was given highest priority that the Sangha was able to survive. Rather than try to find ways to adapt the Sangha to Western conditions, Ajahn Sumedho considered it more important to establish the monastic life according to Vinaya and tradition, and allow it to adapt gradually – the way that it has done over the centuries in Asian countries. As always, a high standard of conduct is maintained; and with the native familiarity of most members of the Sangha with the ways of society in the West, people are finding the guidance and example of the community very relevant for their present circumstances. Meanwhile at Chithurst, the forest is gradually being restored through the planting of thousands of native hardwood trees. It offers an ideal environment for meditation huts, and bhikkhus now may spend the entire Vassa living in the forest and receiving their daily alms food from local villagers. Several tudong walks (long-distance pilgrimages) have taken place, including one by the nuns in 1984 to move from Chithurst to Amaravati; this practice seems set to establish itself in the West, as it has done in Thailand. However, living in the Dhamma makes one’s outlook practical and immediate; the future is the unknown, and for now we can only practise what we do know and aspire to live with a quiet heart. 1 bhikkhu: Buddhist monk. Ajahn is a romanization of the Thai rendition of the Pali word acariya, meaning teacher or guide. In monastic usage it implies authority; e.g. junior bhikkhus are expected to train for at least five years under their Ajahn. 3 Rains: the seniority of a bhikkhu is determined by the number of yearly monsoon-season retreats that he has spent in the robes. 4 Whereas a bhikkhu is a fully ordained monk who follows 227 precepts, a samanera is a 10-precept novice (who nevertheless wears the same ochre-coloured robes as the bhikkhus). In Thailand, the samanera stage is often reserved for those too young for full ordination. Por kao and maechee are 8-precept monastics, male and female respectively; in England, the Pali terms anagarika and anagarika are used. 6 upasampada: acceptance into the order of bhikkhus (‘ordination’). This must take place within a prescribed boundary, called a sima. The late Ven. Dr. Saddhatissa was the senior Theravada bhikkhu in Britain at the time, and Senior Incumbent of the London Buddhist Vihara. 7 upajjhaya, or preceptor: a bhikkhu of more than ten Rains who has the authority to confer full monastic ordination. 8 This phrase is found in the traditional Theravada morning and evening chanting, a characteristic of a Sangha which is sincere in its practice.